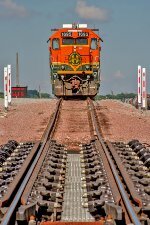 Description: BNSF 1912 and BSF 1695 are two of four SD40-2s assigned to Hobson Yard equipped for Hump Service. Here they pause in the Hump Stub for servicing. Description: BNSF 1912 and BSF 1695 are two of four SD40-2s assigned to Hobson Yard equipped for Hump Service. Here they pause in the Hump Stub for servicing. Seen here from in the cab of BNSF SD60M 8100. Description: BNSF 1695 and 5983 both await disposition at MAC. BNSF 5983 has a shattered conductors side windshield on closer inspection.